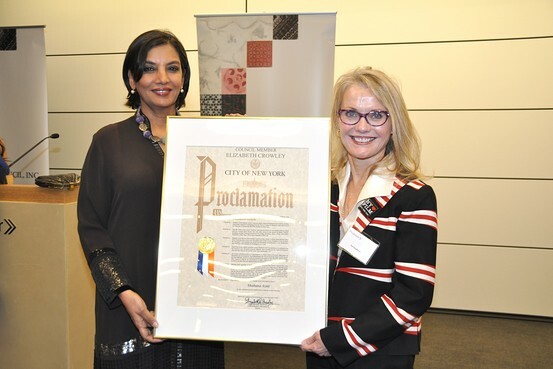 Shabana Azmi receives a proclamation from Pat Kaufman of the New York governor’s office Mar. 24. Padma Bhushan awardee Shabana Azmi has been honored by the city of New York for her contribution to cinema and her involvement with the movie industry, becoming the first Indian actor to receive the honor from the city. Azmi, 61, was presented with the proclamation by Patricia Kaufman, executive director of the Motion Picture and Television Development from the office of New York Governor Andrew Cuomo as well as with a “Certificate of Special Congressional Recognition” by New York Congresswoman Carolyn Maloney. The proclamation also applauded her work as a social activist. “Coming from the city’s council in recognition of my work in cinema is obviously something that makes me very happy,” Azmi told PTI. The proclamation added that her presence on the board of the Indo-American Arts council has inspired hundreds of Indian film makers in the New York area for over a decade. Azmi has served as an advisory board member of the annual New York Indian Film Festival, established by the IAAC in 2000. The annual film festival, which brings together feature films and documentaries from and about the Indian subcontinent, will be held this year from May 23 to 27.